Civil Defence measures are designed to deal with immediate emergency conditions, protect the public and restore vital services and facilities that have been destroyed or damaged by disaster. Historically, The Civil Defence Policy of the Government of India, till the declaration of Emergency in 1962, was confined to making the States and Union Territories conscious of the need of civil protection measures and to ask them to keep ready civil protection paper plans for major cities and towns under the then Emergency Relief Organization (ERO) Scheme. The Chinese aggression in 1962 and the Indo- Pak conflict in 1965 led to a considerable re-thinking about the policy and scope of Civil Defence. The Civil Defence Act, 1968 (Act 27 of 1968) was passed by Parliament in May 1968. The Act extends to the whole of India and provides for among other things measures not amounting to actual combat, for affording protection to any person, property, place or thing in India or any part of the territory thereof against any hostile attack, whether from air, land, sea or other places, or for depriving any such attack of the whole or part of its effects, whether such measures are taken before, during, at or after the time of such attack. It also authorized the raising of Civil Defence Corps and for making Rules and Regulations for Civil Defence. The Civil Defence Act,1968, has been suitably amended by the Civil Defence (Amendment) Act, 2009 by Notification No. 3 of 2010, to include the disaster management as an additional role for the Civil Defence Corps, while retaining its primary role. The additional role in disaster management will be enacted by the Civil Defence Personnel before, during and after emergencies arising out of calamities/ disasters, whether natural or man-made. 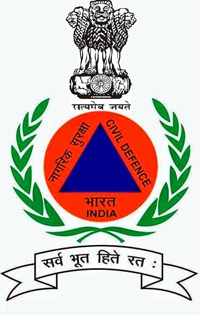 Although the Civil Defence Act, 1968 is applicable throughout the country, the Organisation is only raised in such areas and zones which are tactically and strategically considered vulnerable from enemy attack points of view. Civil Defence towns have been converted into districts and categorization of the districts in respect of State/ Union Territory is appended herewith 100 Multi Hazard Prone Districts Civil Defence activities are restricted to 259 categorized towns spread over 36 States/Union Territories. The objectives of Civil Defence are to save the life, to minimize loss of property, to maintain continuity of production and to keep high up the morale of the people. During times of war and emergencies, the Civil Defence organization has the vital role of guarding the hinterland, supporting the Armed forces, mobilizing the citizens and helping civil administration.The concept of Civil Defence over the years has shifted from management of damage against conventional weapons to also include threat perceptions against Nuclear weapons, Biological & Chemical Warfare and natural and man-made disasters. Civil Defence is primarily organised on voluntary basis except for a small nucleus of paid staff and establishment which is augmented during emergencies. The present target of Civil Defence volunteers is 14.11 lac, out of which 5.38 lac have already been raised. Civil Defence is primarily organised on voluntary basis except for a small nucleus of paid staff and establishment which is augmented during emergencies. However, Duty/Training allowance is admissible to the C.D. Volunteers. These volunteers are administered and trained by Deputy Controllers, Medical Officers and C. D. Instructors which are full time paid posts. The Civil Defence Organisation is need to have a strong presence in all districts of the country in order to attain a target of 1 Crore volunteers in the country by 7 years. To help the State Governments, the Central Government reimburses 50% of the expenditure incurred by the State Government on the authorized items of Civil Defence for raising, training and equipping of Civil Defence Services etc for North- Eastern States excluding Assam and 25% for other States including Assam in the form of grants-in-aid, some part of the expenditure incurred on the authorized items of Civil Defence for raising, training and equipping for Civil Defence. Every year, these grants-in-aid are released in the form of reimbursement share of expenditure while setting, the quarterly claims submitted by the State Governments. As such, the budgetary provision of 10 Crore for reimbursement to State Governments has been made for the year 2017-18. A centrally sponsored scheme was launched by Government of India at a cost of `100 Crores in 2009 for revamping of Civil Defence Setup in the country during 11th plan. The scheme envisages creation of new Civil Defence Training Institutes (CDTIs) in 17 States, in addition 100 multi hazard districts have been selected for creation of Civil Defence infrastructure. A pilot project has also been launched in 40 selected towns to train and utilize Civil Defence Volunteers in internal security tasks. by Government of India had approved the centrally sponsored scheme for mainstreaming Civil Defence in disaster risk reduction for duration of five years – upto march 2019 amounting to Rs. 290.89 Crore. The fund of Rs.15 crore had been released to the States of Andhra Predesh, Chhattisgarh, Himachal Predesh, Jammu & Kashmir, Karnataka, Kerala, Mainpur, Meghalaya, Mizoram, Nagaland, Odisha, Telangana and West Bengal States for the implementation during 2014-2015. Apart from carrying out training and rehearsal/ demonstration of Civil Defence measures during peace time, Civil Defence volunteers are also deployed, on a voluntary basis, in various constructive and nation building activities, which include providing assistance to the administration in undertaking social and welfare services and in the prevention/mitigation of natural/man-made disasters as well as in post- disaster response and relief operations. Civil Defence training is conducted by the State Governments/UT Administrations in three tiers, i.e. at the Local/Town/district level, State level and National level.The training of master trainers and specialized training is conducted at the National Civil Defence College, Nagpur and team/leadership training is conduct at State Civil Defence Training Institutes. Training of the volunteers in Civil Defence Organization is conducted at local/town levels by trained trainers in the form of short-term training programmers.